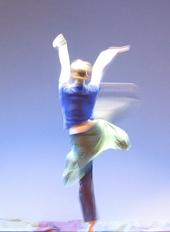 Dancing with God. A Christmas Journey..
She is, let’s say, 16 years old. She’s not married. We must assume there’s a Mom and Dad around somewhere, and given the Deuteronomic law they live and move and have their being within, the parents have got to be upset. And her boyfriend has the legal religious right, almost obligation, to get a gang of his buddies together and stone her. To death. Are they looking at her? Can they see yet? She’s brought shame on her family, her fiance, her neighborhood, and herself. She deserves whatever happens to her! She does! All right, now..what follows now is my imagine gone wild (but certainly within these wide-getting-wider scriptural boundaries ). I’m imagining the “wise-beyond-her-years” Mary becoming more and more aware of her predicament. She knows what it looks like to the world. Maybe she has put off telling anyone about that weird night that may have been a dream, but it wasn’t a dream, and now her belly is swelling and she knows she’ll be able to hide for awhile from the men around her.. but not from her Mama. Mother will know. Her periods began just last year, and Mom has helped her each time to clean herself because that was important and the scriptures said that’s how a Mother and a daughter should do it. This month, Mom would be wondering then asking why Mary was late, “Let me see,” she might say, and so Mary has to tell her, show her. Her breasts are a little sore now too and while she is not afraid of her mother, she is- afraid? yes, a little/ a lot- of the men around her. Because that’s the only way a baby could get in there- right?- but she hadn’t done anything.. had she? She doubted herself sometimes- maybe? somehow? what if?- but no!no! nonono: she knew what she knew and even if no one else believed her.. she knew. Will he believe her? Will Joseph believe her? How could he? But he will! Of course he won’t; who will ever believe me, she wonders. So what will happen? or maybe she will never need to feel afraid again.. Irony, Paradox, Tension. A Christmas Journey.. In a court of law, the whole story would be torn apart by even a mediocre prosecutor as soon as the words “virgin” and “pregnant” were used in the same sentence. Throw the dice. OK, 2 out of 3? 4 out of 7? Rock, Paper, Scissors? Eenie, meenie, miney, mo? Draw straws. Who’s right; who’s wrong? Who’s telling the truth; who’s lying? Who is being good? Who is being bad? Here’s one more really great thing about the Christmas story that not many people have considered: it makes no sense. Two completely different birth stories- Matthew’s and Luke’s- that come together only on Hallmark Christmas cards and childrens’ Sunday School handouts. Unlikely scenarios, difficult time-lines, and a cast of characters that includes a chorus of singing angels- it is through that wild potpourri of people and events that Jesus the Messiah appeared in the world, and turned that world into a new creation. It made no sense and neither, if we admit it, does much of life. If we had a nativity story that followed a logical, consistent, and progressive series of facts, we would have every right to question all of it. When that kind of defense is put forward in a criminal court- when all of the witnesses and facts line up in perfect and straight rows, the prosecution can pretty easily show that there has been collusion and rehearsal in the presentation of a fictional defense. Life, as we live it, is rarely an either/or set of decisions. We deal with people both as we hope they will be and as they are. We enjoy the food at a restaurant even though the service has been lousy. (Both/And) We do not throw our kids out of the house because their room is an unhealthy mess (Either/Or). We learn to cut slack because slack is being cut for us all the time. We learn to give love and accept grace because we’re accepting love and extending grace all day long in our daily affairs. We may talk a lot in black & white, and even make some decisions based on what seems good and what seems bad, but we live in the inconsistencies of human interaction and in the chaos of a world that always being recreated. The story of Jesus’ birth is a mess. So messy that Mark and John ignore it altogether. But that makes the story a lot like us. At least a lot like me. I’ll let you decide for yourself. That way both you and I will be right. Joseph, chagrined. A Christmas Journey..
fewMatthew 1: 18-19 The birth of Jesus took place like this. His mother, Mary, was engaged to be married to Joseph. Before they came to the marriage bed, Joseph discovered she was pregnant. (It was by the Holy Spirit, but he didn’t know that.) Joseph, chagrined but noble, determined to take care of things quietly so Mary would not be disgraced. 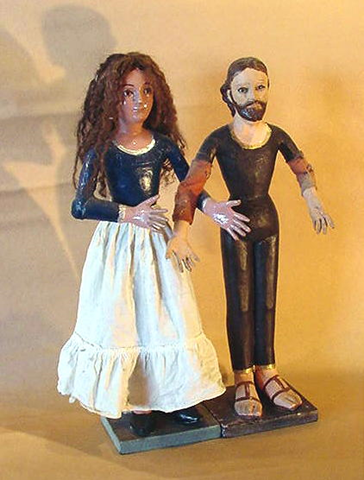 carved Santos figures, “Mary and Joseph”, Guatamala, early 20th C.
According to Matthew, Joseph had a choice. What to do about his fiance Mary who was now pregnant, without his participation? Stop right now if you’re imagining how it went with your cousin/brother/neighbor who went through the same experience just a few years ago. Mosaic law was a whole other animal than the rage and hurt faced by that guy you know. In other words, this wasn’t the kind of problem that would merely cause the neighbors to gossip, or prompt the local judge to make the “wayward girl” wear a red A across herr chest. This was the kind of sin that could cause YHWH Godself to regard a person for the rest of her life with an angry scowl and a slingshot full of punishment. Decisions, Decisions, indeed! Matthew describes Joseph as chagrined, chagrined but noble. He was noble in that he didn’t give into his chagrin and do the “easy thing,” which would have been to let Mary be stoned. (I remind you, don’t try to project the way we might think about such an incident as 21st C. Americans. These were people that had a place just outside of town reserved for stonings. They happened regularly for a whole variety of spiritual and civil crimes. It was a BIG DEAL, yes, but not the kind of incident that would cause Nancy Grace to scream indignantly [and correctly] on cable TV for months and months). Joseph and those close to him- because this kind of decision would have been an extended family decision- decided not take the easy way but, instead, “[they took] care of things quietly so Mary would not be disgraced.” Or dead. Most likely that meant keeping her under the radar of the religious legalists- the ones who love- LOVE!- the black ink of rules much more than the red blood of humans. It meant, to some degree, becoming a family of religious outlaws- purposefully breaking the Mosaic law in the way Jesus himself would often break Mosaic law when it interfered with the lives of humans. In that way, Joseph foreshadowed the kind of decisions his step-son would become famous for making. Jesus didn’t die with his mother at the stoning ground before he was born, as could very well have happened. He did die at a similar killing ground, though, about 33 years later when the religious legalists colluded with the civil authorities to shut him up. His season in the sun that preceded Golgotha was, apparently, planned and coordinated by Jesus’ acknowledged heavenly father. But let’s be sure to always give his earthly step-father his due, too. Joseph stopped the horrifying from happening before the story ever had a chance to begin. Mary, the Girl. A Christmas Journey..
Mary was young. In the context and customs of her time, she was (almost certainly) 15 or 16 years old. There is nothing biblical that would make Joseph too much older than that, either. “The Annunciation” by Henry Tanner, 1898. The angel Gabriel here is a column of light. Young Mary is alone. 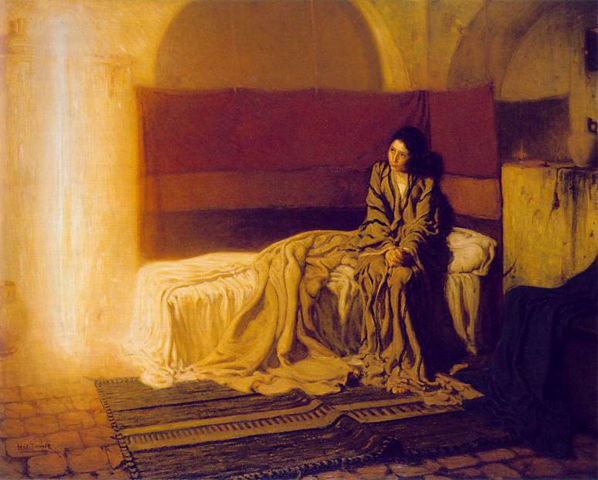 This painting was controversial because, like the earlier painting shown next, it portrays Mary on a bed. 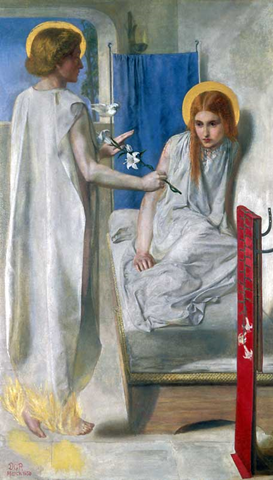 “Acce Ancilla Domini” by Dante Gabriel Rosetti, 1850. Despite the confidence we read into the words of Mary as they were scripturally preserved, she was no doubt confused. THERE WAS AN ANGEL- A MAN ANGEL!- IN HER HOME TELLING HER SHE WAS ABOUT TO BECOME PREGNANT! Painters felt free now to portray that surprise, that fear, that hesitation. By the 1920s, Sigmund Freud had opened many psychological doors for painters and other artists to explore- psychological doors of the painters themselves, their subjects, and of viewers of the art. 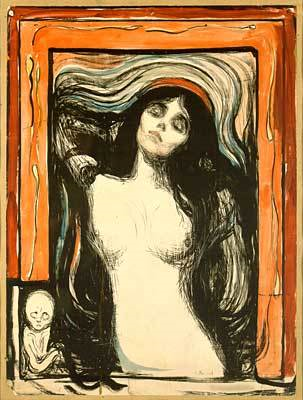 By the time the Norwegian artist Edvard Munch (yes, the same artist who did “The Scream”) painted “Madonna” in 1895, there were few restrictive religious rules or prohibitions still in effect. This painting reflects both the freedom felt by artists of this period, and freedom from the enforced non-sexuality of Mary by the Church. Religious art is an outward and visible means of better understanding contemporary theology. The biblical story is not a static one. It has been thought about and understood in many different ways and it is too easy for any one cultural group in a particular time to believe that theirs is the only and proper interpretation. Artists remind us that God is not suspended in anyone’s time. And they remind us that Jesus, the Word made flesh was born of a very real young woman: the flesh made Word. He was like us because she was like us. First Steps. A Christmas Journey..
Liminality is a seldom used but much needed word. It comes from the Latin word limina, which means threshold. The place of liminality is a crossover point, a threshold to step across, a door to go through. It involves the movement from one state of being to another- the movment from single life to marriage, for instance. That period of engagement is the threshold to marriage; steps have been taken away from being single toward marriage. The time of preparation, from the time that agreement is mutual to those moments before the marriage vows are completed, is liminal time. 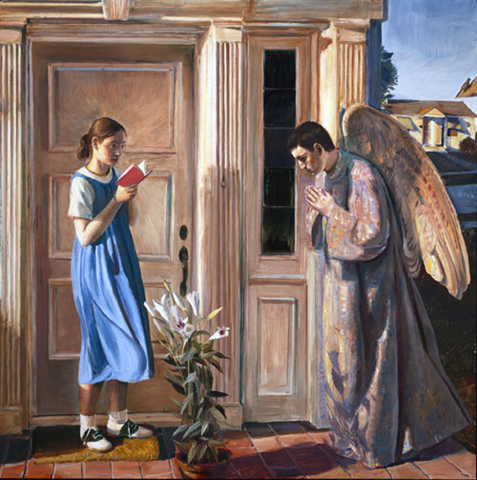 OK, you know the rest; but what happens between Gabriel’s *KnockKnock* and the acceptance of the Angel’s message by Mary, is liminal time. It is very much like the still point in dance- that moment when the dancer completes one movement and prepares, in stillness however briefly, for the next movement. She was thoroughly shaken, wondering what was behind a greeting like that. 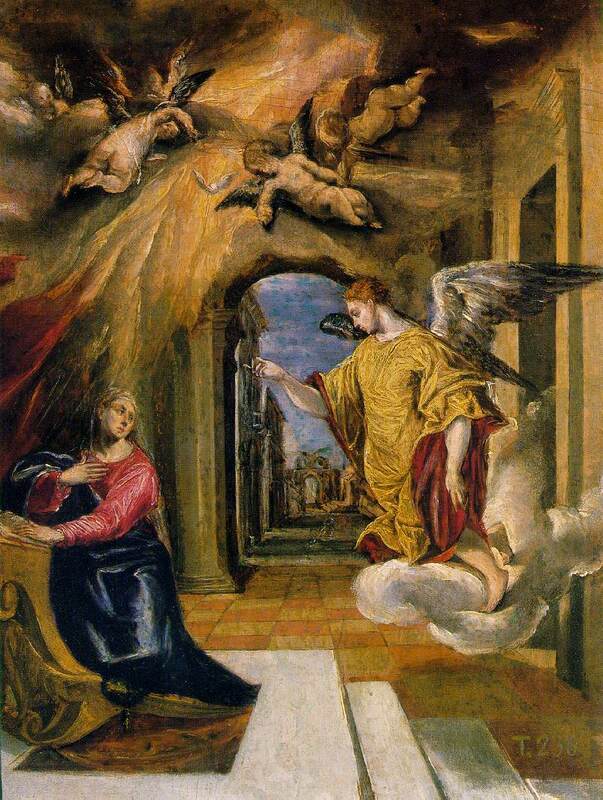 Mary had to agree for the contract being proposed by Gabriel, between her and God, to be completed; she had to take a step across the threshold. In doing so, she knew her life would never again be the same as it had been the day before. Liminal times demand decisions. Our own liminal moments occur with incredible frequency. We are often moving across, through, and over thresholds that cause everything to become new. 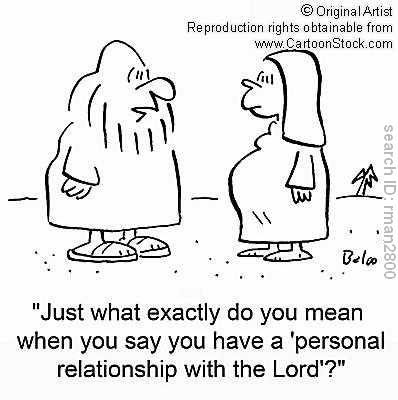 It’s not like we have to become pregnant with the Messiah, or even to get married for all things to become new (although both those things will do it!). We are often presented with opportunities (large and small) for education, for meetings with new people, the chance to visit new places, or to participate in new experiences. All of those events are filled with liminal possibilities. But they are not all opportunities or chances that are easily entered into. Many have curtains of fear- imagined and real- draped across them, and which must be crossed. People don’t go to school because they’re afraid they’ll run of money. People don’t get married because, “Who will take care of Mom and Dad?” People will stay at mundane, mind-deadening jobs, because they dare not risk losing a guaranteed paycheck. The dance for them, stops. The still point becomes a period, the end of a sentence that could have become a paragraph, even a chapter in an epic saga! So, in liminal fog, a suspended animation, so many/ too many people choose to be safe. They stay where they are, though unhappy; they refuse to look beyond the fence, because the grass over here is good enough; and they miss the mysterious smorgasbord of Life in favor of the already familiar meat loaf special. They choose to miss being pregnant with Messiah. They choose to miss being part of all things becoming new. Gabriel, Archangel. A Christmas Journey..
38“I am the Lord’s servant,” Mary answered. “Let it be.” Then the angel left her. Perfectly trusted by God, chosen by God, and ready to serve God, Gabriel is a divine ideal, a man so perfect he cannot be allowed by men to be a man. For humans wanting to move toward divinity the angels serve as intermediaries- roadside parks on the way to the Grand Canyon! No matter how close we come to them, angels will be just a little bit beyond us. In the religious narrative, they are good goals: they are both approachable and beyond our reach. But Gabriel, in all European art of this period, is always shown in his super-humanness as crouched or bowing in front of Mary! No, we cannot be like Gabriel no matter how hard we try, but Mary- it seems- is like Gabriel without trying at all! She simply is. “I am that I am,” could be her name, too. She didn’t need to aspire to worthiness, and she didn’t need to ritualize her way to godhood. She didn’t have to be good enough, righteous enough, or educated, pretty, or well-dressed enough. She just had to be. And then to be willing. After Mary said that, what else was there for an archangel possibly to do but leave?